Four key concepts exist that frame our discussion of the application of God’s redemption. These four include sovereignty, death, faith, and love. As discussed previously, the problem of evil can be presented using three premises. Premise 1: If God is all powerful, He could prevent evil. Premise 2: If God is all good, He would prevent evil. These premises yield the following possible conclusions. However, as noted in the last installment, I believe that none of these conclusions is satisfactory. I think that a good, biblical definition of sovereignty is supreme control. A sovereign can be faced with a choice between two or more logically incompatible desires. For example, we could say that God desires glory every moment of existence. We can also say at the same time that God desired restoration of sinful people. Now, that restoration of sinful people required Jesus (God) to humble Himself (giving up glory) to come to earth to die. But notice that the result was not a nullification of God’s sovereignty. Rather, God exercised His sovereignty in control of all events to accomplish His prioritized will. When God’s desires offer conflicting actions (as seen above), God will act according to His own established priority of what He determines as the greatest good. God, then, exercises effectual sovereignty in the following manner: God is (recall the great I AM) according to His attributes (love, justice, holiness, etc. ); God wills according to His essence; God prioritizes according to His will; and God controls according to His priority. The result is (said another way) that God sovereignly controls to accomplish the priority of His will in accordance with His essence. That being so, we can look back at our three premises, reject all three specified conclusions, and offer a fourth—that is, that premise #2 is false. The use of the word “would” in premise #2 indicates a presumption on our part of how God would structure the priority of His desires. We simply cannot do that. That is God’s prerogative, not ours. However, we can review what we know about God and how He has performed, and conclude His choice of priority. 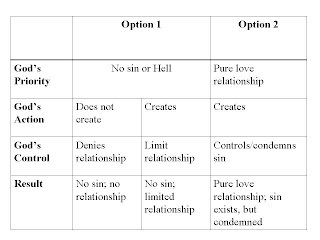 In the following chart, option 1 assumes that God’s priority is to prevent sin. From that priority He may choose not to create or to create, sovereignly controlling the situation so that the result conforms to His prioritized will. Option 2 presumes that God’s priority is in establishing a pure (uncoerced) love relationship with His creation. He acts by creating; He sovereignly controls and condemns the resultant sin; and He brings about the result of His prioritized will—the pure love relationship. A question may arise as to whether God is just in allowing sin to occur (a question that goes back to premise 2 of the problem of evil). The answer is that God is just in doing so. Romans 3:21-26 explains that God overlooked the sin in the past and was just in doing so because of His revelation of the righteousness of Christ through His life and atoning work. Based on this discussion, we can conclude that sovereignty is God’s control in accomplishing His prioritized will. Ephesians 2:1-5 provides clear indication that we are dead in sin. Some emphasize the use of the term dead so as to define us as totally lifeless and incapable of anything spiritually. I hesitate in accepting this merely because it presents too much of a problem in justifying our use of “dead to sin” for the believer (the believer still sins although dead to sin). This key concept, I believe, is better thought of as separation from God. Since God is all that is spiritually good, just, etc., as God moves away, a person is left in that which is not spiritually good, just, etc. Thus, apart from God, we cannot spiritually comprehend anything as it relates to the goodness and righteousness of God. From that definition we can see clearly how incapable people are on their own to ever act, choose, or merely believe in spiritual good. Paul argues at the end of Romans 3 and the beginning of Romans 4 that faith is not a work. In other words, faith is not some merit by which we earn or deserve anything. Faith is, however, assent to spiritual awareness. This discussion, then, shows that faith, the assent to spiritual awareness of goodness (or anything about God), is not possible for those who are dead (separated from God), as is illustrated in Matthew 7:18. Thus, our conclusion of this key concept is that God must act first in order for a person to be aware spiritually. Several truths are presented to us from Scripture regarding faith. First, the removal of faith from God to self was how the Garden was lost by our first parents. Eve removed faith from God’s declaration and command and placed it in her own judgment, believing Satan’s lie. Adam removed faith as well from God in his misguided reasoning concerning the woman’s unity with him. Thus, the transference of faith by both of them caused the acts of sin in disobedience to God’s command. Throughout the ensuing covenants (see post titled Covenant Theology 5/15/08), faithfulness (a conditional response to faith) was always our obligation to continue in covenant toward its promised blessings. Obviously, we failed in that faithfulness. But Christ came and faithfully accomplished all covenant obligations. Then, in His substitutionary death, He made it possible for us to be restored in righteousness (being given His righteous faithfulness in exchange for the guilt of our sin). But this justification, the Bible tells us, is by faith. In other words, misplaced faith that caused the fall is now full circle that which is required for reconciliation. But our conclusion in the Death discussion was that separation from God made us incapable of this required faith. How then can we receive so great a salvation? Some people have reasoned that regeneration by God must of necessity be applied first, giving us the grace in removal of sin and embrace by God (ending the separation) so that we may then be spiritually aware to assent to the salvation of God. In other words, since faith is impossible apart from God, regeneration must precede faith in the logical order of salvation. The problem that I see with this logical construct is that the preponderance of biblical emphasis seems to place faith logically prior to salvation. - Romans 3:24-25 indicates that “the redemption that is in Christ Jesus” is “to be received by faith,” denoting that faith logically precedes the redemption. - Romans 3:27 indicates that boasting is excluded because of the law of faith. If regeneration precedes faith, why is Paul’s argument not that boasting is excluded based on the unconditional regeneration rather than by the law of faith which supposedly occurs (logically) later? - Romans 5:1-2 indicates that we are given access (notice the order) to the “grace in which we stand” by faith. It does not say the reverse—i.e., given access to faith by the grace in which we stand. - Romans 3:22 indicates that the righteousness of God came to us through faith. - Ephesians 3:17 indicates that Christ dwells in our hearts through faith. - Romans 10:10 Paul says in this verse that believing results in justification. The Greek eis means unto or entrance into or toward or (as the NASB puts it) resulting in. Obviously there are additional passages. And excuse me for not sticking only with passages in Romans (which was my original intent), but I thought the Ephesians and John examples were good ones again to show the emphasis that God places on faith. What doesn’t sit squarely with me in the order of regeneration first and then faith, is why Scripture emphasizes faith if it is, in essence, a byproduct rather than the initiator of the logical process. With the emphasis of faith toward regeneration that I see in the above examples, and with the difficulties presented by reversing the logical order (i.e., that faith becomes a logical byproduct rather than the initiator), my conclusion is that faith is God’s basis by which He applies accomplished redemption. The fourth key concept—love—will be discussed in next week’s post.